Summer is here and it's time to make your balcony a little oasis in the city! Extend your living space to the outdoors by following these tips, and make your own safe and beautiful sanctuary in the sky. Add some colour to your balcony with low maintenance plants like Marigolds, Chrysanthemums, and Ferns. You won't have to water them everyday which is good for you, and also good for your neighbours living below you. Enjoy your balcony at night by adding some string lights. 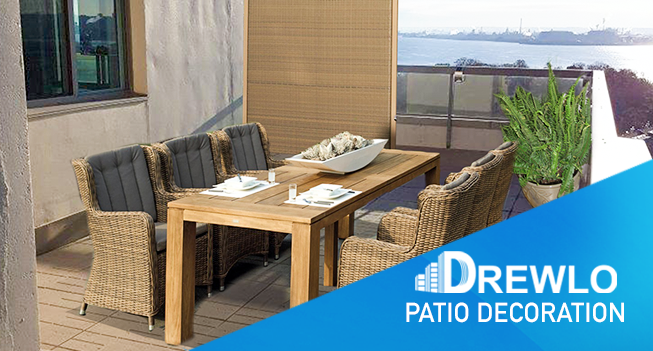 Most Drewlo balconies come equipped with an outlet so you can plug them in safety outdoors. Please note, string lights are the only item allowed to be hung from balcony railings. An outdoor rug is an inexpensive way to add some cosiness to your balcony. Available in a variety of colours, outdoor rugs are a great way to extend your indoor living space to the outdoors. Note: outdoor rugs cannot be glued down or left out during the winter months. You might not want to stare at your neighbours across the street while you enjoy your balcony, so try adding a portable privacy screen. In addition to privacy, they add shade and fold up when they're not in use.